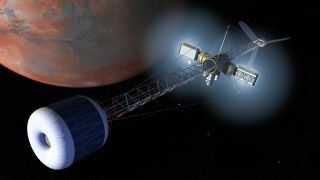 Artist's rendering of a Mars artificial gravity transfer vehicle. NASA astronaut Kate Rubins works with a Nitrogen/Oxygen Recharge System tank aboard the International Space Station. The tanks are designed to be plugged into the station's existing air supply network to refill the crew's breathable air supply. The alternative is to use "photo catalysts," which work by absorbing light particles – photons – into a semiconductor material inserted into the water. The energy of a photon gets absorbed by an electron in the material which then jumps, leaving behind a hole. The free electron can react with protons (which make up the atomic nucleus along with neutrons) in water to form hydrogen. Meanwhile, the hole can absorb electrons from water to form protons and oxygen.